What type of hardwood is shown? - ? what color paint is the black? It looks like Black Walnut with an additional stain to me. 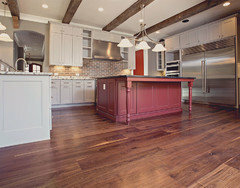 Here is a similar floor with a natural finish. Is there a specific name for the design of the fireplace? - I love the tiered look - is there a specific name it is called? and do you know what material it is? Thank you in advance! Rug??? From where? Maker? - Where is the rug from? 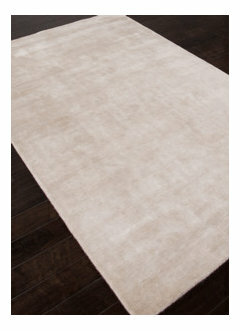 The sheen you see in the image is a natural effect of the bamboo silk fiber. How can I find the chandelier? Love the color on the wall!! Is it dark Blue? - Would like to have this color in my livingroom. Do you have a code for this color or a name? Thanks! annoying! Seems like the "designer" would be in "the know" with this site/this project.. perhaps you could suggest it photographer seeing that there is obviously a lot of interest in things you are not aware of.. I do find it interesting, however, that you know so much about the lighting but so little about other details.. any chance you could have designer cue in to answer questions?? Mirror - What is the material around mirror and where did it come from. Hi, thanks for your question. I am the photographer for this project, however if you review the photo credits you will see the interior designers information and contacts. Where are the sofa and chairs from? How do you eat corn correctly? What color is on the walls? - Color? They may be custom as most of the designer Laura Hay's work is. Where are the side chairs from? Hi, I am the photographer for this project. You would need to ask the designer Laura Hay. Thanks! They look like Pearson chairs. Are they? Laura Hay is really great! I love the architectural details of this room, especially the fireplace surround. The black and white palette gives the room a classical feel, accentuating these decorative features and makes the room appear more spacious. Lisa, I love the way you were able to capture all this detail in one symmetrical shot of this beautiful room. Great work! Help for small living rooms - What size is this living room? It looks like mine, but mine seems very small and difficult to arrange the furniture. I'm not sure the dimensions, the designer Laura Hay will know more. This was shot in a larger than average home however this was the smaller sitting room of the house. 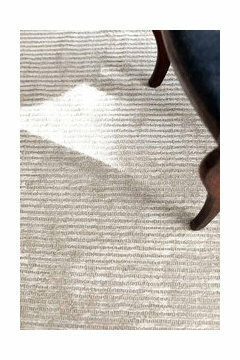 Where can I find this rug? Hi, I'm the photographer for this project. You would need to ask the designer, Laura Hay DECOR & DESIGN. Thanks. Paint color - Great blue, what is it? I'm sorry I'm not sure. You would need to as the designer at Laura Hay DECOR & DESIGN. I'm the photographer for this project. What colour and brand of black was used on the walls? - Choosing a black paint isn't as easy as it seems. 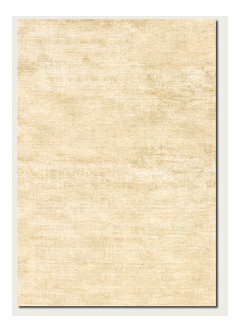 Which paint and what type of finish creates the cleanest and classiest effect? Hi, you would need to ask to designers listed for this project. Laura Hay. Where did you find this coffee table? I love it! Hi, I'm the photographer. You would need to ask the designer Laura Hay. Hi, sorry I am the photographer. You would need to ask the designer. Thanks. What type of material was used beneath the fireplace? Where can I buy this sofa? Hi! I am the photographer for this project. The designer is Laura Hay and she can help you with your design questions. Does the designer or builder have plans that I could purchase? 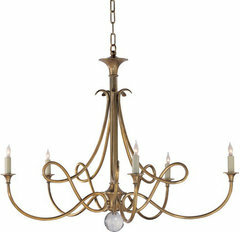 Chandelier - Who makes this beautiful chandelier? Paint color on the Wales? - Can you please share the paint color? Blue wall color - What is the name of the dark blue accent wall? Those floors - Those floors are beautiful! What kind of floors are they??? What style and size are the sofas? Where did you find the rug and wha - What size and style are the couches? Thank you! Where can I get the fireplace surround? 3. Classic with contemporary. This room demonstrates the mix of different decor styles in a room, but here it is done by juxtaposing classic architectural details — arched doorway, crown molding, built-in shelves — with more contemporary furniture. The lines of the sofa, chairs, coffee table and mirror above the mantel are more modern than the finishes of the room. Note that this approach doesn’t work with every architectural style — midcentury homes often look wonderful paired with midcentury furniture, and modern, glass-walled homes might look odd filled with traditional American antiques — but placing a few pieces of contemporary furniture in most spaces often works. Linen Pillow Cover With Pompom Trim, 20"x20"